Delight in onion risotto flavors without the long wait! 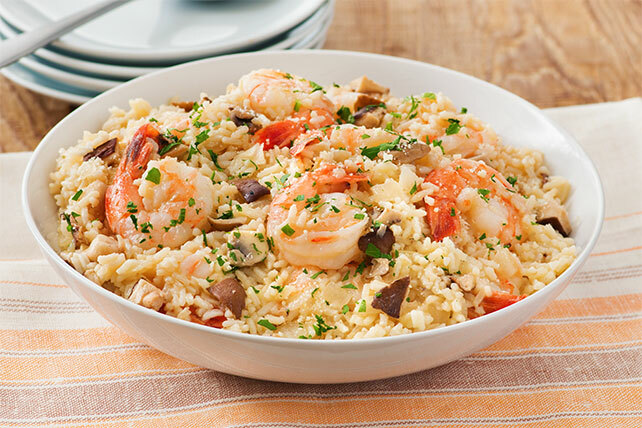 Try this Weeknight Shrimp and Onion 'Risotto' recipe that's ready to serve in under an hour. Melt 1 Tbsp. of the butter in large deep nonstick skillet on medium-high heat. Add mushrooms; cook and stir 7 to 8 min. or until tender and golden brown. Remove from skillet. Add remaining 1 Tbsp. butter and onions to skillet; cook and stir on medium heat 7 to 8 min. or until onions are tender and golden brown. Stir in rice until well blended. Add broth and pepper; stir. Bring to boil. Reduce heat to medium-low; cover. Simmer 5 min. or until rice is tender. Stir in shrimp and parsley; cover and let stand 10 min. or until shrimp are heated through. Add mushrooms and cheese; stir. Prepare as directed, using KRAFT Reduced Fat Parmesan Style Grated Topping. Substitute 1/2 cup dry white wine for an equal amount of the broth. Add 1/2 tsp. dried thyme leaves along with the pepper.